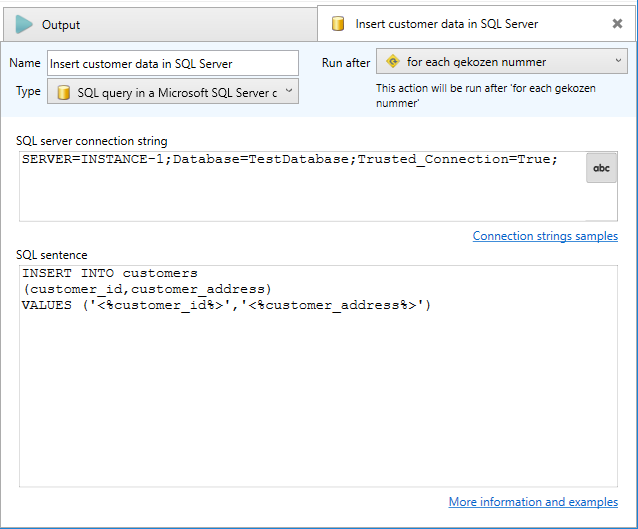 If you run Email Parser in the same computer where SQL Server is running the connection string is usually as simple as the one shown in the screenshot above. For building more complex connection strings or if you do not know where to start the best way is to download this tool from Microsoft Technet and then copy the connection string in Email Parser. In that link you can find a step-by-step guide on how to generate one. As Email Parser itself is not a SQL editor it is strongly recommended that you use an external tool to test and build your SQL sentences and later copy them to Email Parser. The most widely used tool for this task is the Microsoft SQL Server management Studio. If you have already installed SQL Server you will probably already have that tool installed but if not you can download it freely from the Microsoft website. How to include captured text from an email in a SQL sentence? What happens with SELECT queries? SELECT queries generate Email Parser fields you can use in other actions. There is a specific topic about it.